The year is 1939 and World War II is upon us. The Nazi have raised their own team of elite battery-powered X-Men through scientific means called the Gotterelektrongruppe. The British have access to dark, blood thirsty demons. Both sides make undeniably hard decisions in the effort to thwart the other. Bitter Seeds begins when many of the main players are children and where we see how events of the past entwine their future for the rest of the narrative. The British dark magicians pass on their knowledge to their children for some very interesting reasons. The subject matter involving Nazis may turn some people off, but Tregillis handles delicate matters deftly and does not at all show support or in any way condone what they did. In fact he has clearly made the group at large the bad guys while molding some of the Nazis into deep and complex characters. And he has developed a great mad scientist that rivals Dr. Moreau. Both sides stoop to some very evil yet justifiable depths, but when doesn't that happen in real war? Harsh times call for harsh decisions. Ian Tregillis has arrived and what a bright and promising voice he has brought to bear. Bitter Seeds is an extraordinarily original work of fiction that blends ideas of Alternative History, Fantasy, and Science Fiction seamlessly yet denies being labeled specifically as one type. No matter how you approach it though it wins on each count. The view point switches between various characters but mostly settles on Klaus for the Gotterelektrongruppe who can walk-through walls and spymaster Raybould Marsh for Milkweed, which is a covert group in Britain. Marsh is kind of the Jason Bourne of the book as you follow his missions into enemy territory. Both Marsh and Klaus show unbelievable strength as characters to endure. Tregillis has a knack for knowing when to switch view points. Just when you want to long to see what's going on in the other camp he delivers. Other standout characters are William Beauclerk whose makes pacts with demons he hardly understands and Gretel, Klaus's sister, who is as mysterious as any seer of the future ought to be. Gretel is a very central character as she shapes future events, but to what end is still unknown. The swiftly moving Bitter Seeds is a debut from a new and powerful voice in speculative fiction that I hope stays around for years to come. If you are a fan of dark comics or alternative histories Bitter Seeds would be well worth your time as we see a masterful mix of mad science versus the dark arts unlike any other. I give Bitter Seeds 9 out of 10 hats. 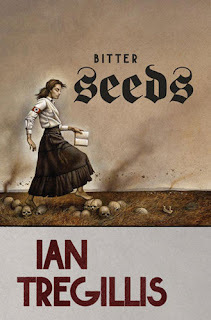 Bitter Seeds is the best debut so far this year and I can't see leaving it off my year end best of list. I suspect it will be on many others as well. Tregillis has caught me as much with his originality this year as much as Jesse Bullington and Ken Scholes did last year. 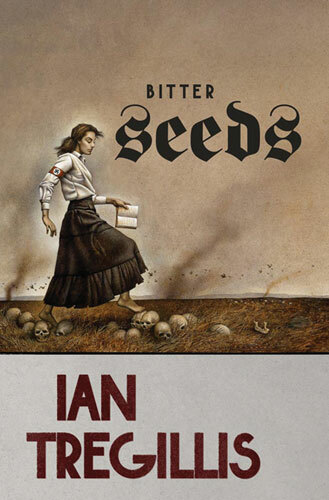 Bitter Seeds is the first in a trilogy, but it more than stands on its own. However, you are left with greater implications on the world stage as events lead into Tregillis's version of the Cold War. The second in the Milkweed Triptych, The Coldest War will be released in February 2011. Tregillis is also part of the Wild Cards consortium helmed by George R.R. Martin with stories in the three latest volumes. Just when I thought I was making a dent in my leaning pile o' books. I got a copy of this yesterday and was curious. Looks like I'll have to read it now! @Aidan - Aren't we always finding something new? I think you'll love the hell out of BITTER SEEDS. Yeah, it seems like something new falls into my lap several times a week. I'll never get to the end of the pile! Bitter Seeds sounds like the perfect thing for when I feel like I need a break from the norm.